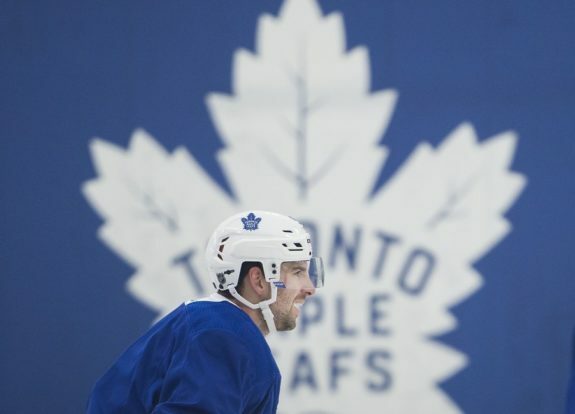 The Toronto Maple Leafs skated out of TD Gardens last night with a convincing 4-1 win over the Boston Bruins. After a season where the Bruins beat on the Maple Leafs, the nature of the win was surprisingly. In fact, Game 1 wins are rare for the Maple Leafs. The last time they won the first game of a series was on April 9, 2003, when they beat the Philadelphia Flyers. Related: Bruins or Maple Leafs – Who Beats Who? Based upon my view, I have compiled 11 thoughts about this game. Some are surprises and some confirmations that what I had seen flashes of earlier this season wasn’t just smoke and mirrors. 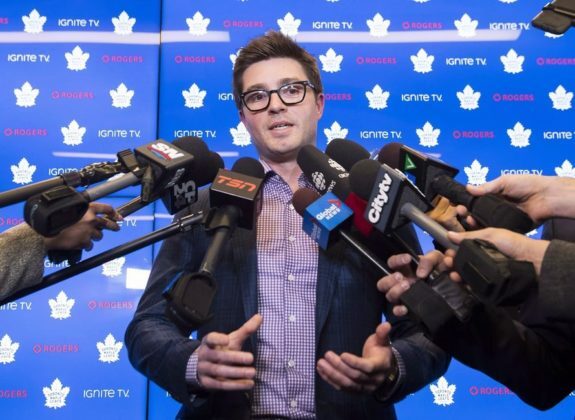 I have thought all season long that Kyle Dubas has a vision of the kind of team he wants his Maple Leafs to be. I think he wants the team’s top three lines to be speed-driven, offensive forces that create so much pressure that they simply overwhelm the other team. We saw some of that speed in Game 1, and it wasn’t only on offense. The Maple Leafs burst into the offensive zone quickly, which has been their game all season. However, the team’s first goal came when they crashed the net, pounced on a rebound, and slapped it past the Bruins’ goalie. But, impressively the Maple Leafs used their speed on defense to pressure the Bruins into numerous mistakes. They hustled all night long, and watching the game film the team should see how crucial such hustle is to winning. As Muzzin noted, “You pressure them, and you can force turnovers and fumbled pucks.” If I am hearing the sub-text to Muzzin’s comment correctly, he’s thinking “just like any other team.” The Bruins are mortal and the Maple Leafs can beat them if they play well. What they did tonight is repeatable. Frederik Andersen looked like the goalie he was at the beginning of the season. He was calm and organized, stopping 37 shots. His stellar play in the second period turned a shot disadvantage into a two-goal lead for his team. I say “organized,” because Andersen seemed to know exactly where to position himself to take maximum advantage of his size and skill. On the other hand, Rask made some good saves but looked disorganized. He stopped 29 of 32 shots, but he didn’t look relaxed. Surprisingly, announcer Jim Hughson and analyst Craig Simpson seemed to keep applauding Rask’s skill in keeping his team in the game. 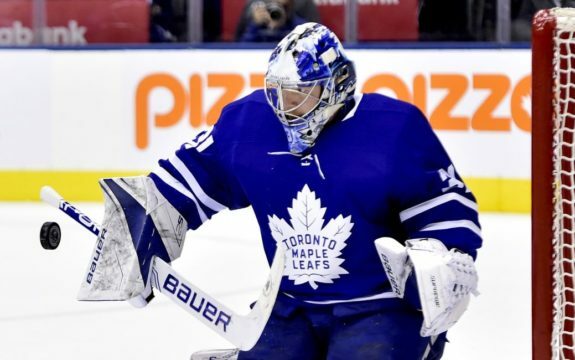 Granted, Rask made a pair of saves in the final minute of period two to keep the Maple Leafs from making the game a blowout. However, I thought Rask was too frenetic and made saves with his face mask, his shoulders, everywhere. I suppose a save is a save, but I don’t think he’s nearly as good a goalie as Andersen is and might be one of the Bruins’ exploitable weak links. Speaking of possible weak links, Zdeno Chara looked old and slow. People expect that of Ron Hainsey, but tonight Hainsey played a far better game than his grizzled-veteran competitor Chara. Connor Brown went around him like he was standing still, and only an interference penalty kept William Nylander from blowing by him, as well. After one whistle, Marner bumped into Chara and you could see just how huge Chara is in comparison to Marner. However, in this game his size and reach didn’t help him. He seemed flat-footed and frustrated all game. Nylander not only scored on a great pass from Nazem Kadri, but played hard all game. In one notable sequence, he battled hard for a puck and won behind the net – all while laying on the ice when his opponents were standing over him. He showed desire and speed all game. With just over a minute left in the game, John Tavares and Patrice Bergeron met for a neutral-zone faceoff. Instead of Tavares trying to win the faceoff to pull the puck behind him, Tavares and Bergeron both tipped the puck the same direction. Tavares was ready, grabbed the loose puck, and scored an empty-net goal. Smart hockey. Auston Matthews might not have made the scoresheet, but his speed and craftiness with the puck made him formidable. He skated through and around Bruin defenders and, were it not for a post, might have scored. When he had the puck, the Bruins were on their heels. Marner’s penalty shot was beautiful. But the penalty he drew was as nice. He tipped the puck into center ice, chased it down, and was tripped by Jake DeBrusk. On the penalty shot, he made Rask look like a bobble-head, coming in from the left side and quickly puck-handling a number of times, before finding the open side. No goalie could have stopped that shot. Kadri might just be the difference in this series, if he isn’t suspended like he was last season. On Nylander’s breakaway goal, Kadri saw the play develop, and made a beautiful pass to Nylander who skated in all alone. 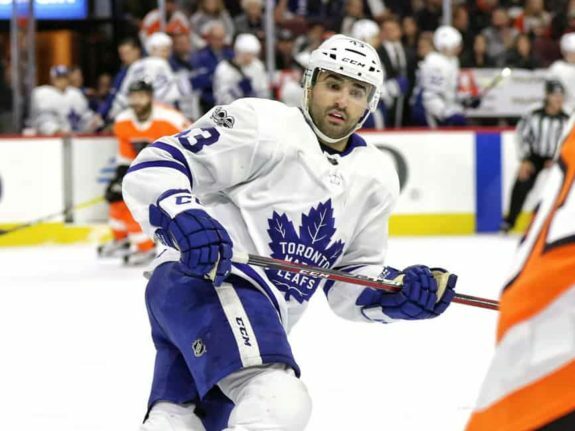 But later Kadri couldn’t keep from riling up the Bruins by yelling across the benches, until coach Mike Babcock intervened and – you could read his lips – told Kadri to “please, be quiet” or something like that. Although I get Babcock’s point, I think Kadri must play just that way to be most effective. He threw his body around all night, and had some punishing hits. The fourth line played less than seven minutes together, but what an impact. They hit, they annoyed, they did their job. Noting the box score and the ice time the trio of Brown, Trevor Moore, and Frederik Gauthier played, I noticed them lots more than they played. Brown always was disrupting, as was Moore. I saw Gauthier take one faceoff, but didn’t notice him much at all. Perhaps that’s good. This was the best game I think I remember Nikita Zaitsev playing. He was strong on the boards and was able to break up Bruins’ offensive bursts. Hainsey seemed to play more offense. When the puck was in the Maple Leafs’ zone, they were on top of the Bruins all night. Game 2 is Saturday night at TD Garden, and then the Maple Leafs head home for games on Monday and Wednesday. 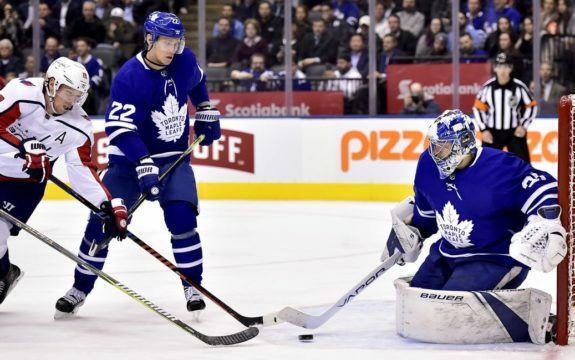 This victory, although a good one for the Maple Leafs, might mean little if the team doesn’t continue to play with the same willful determination. The Bruins have a good team and are more than capable of coming back, just as they did last season’s playoffs.